The trip from the Gold Coast to St Lucia takes an hour twenty. As I pull into the Keith Street lot I realise I remember none of it. It’s our own biological auto pilot mechanism: the parts in the cerebrum that govern movement, speech, and logic shut down, and in their place emotion and memory alight to release fireflies of joy and anxiety. Yet despite the momentary suspension, we usually arrive safe from harm. Human capability, it baffles me. Or at least that’s how I see it. I leave the car checking the lock three times. The Lolly Shop isn’t open this early, but I’ve come prepared. I guzzle a can of liquid cancer and head to level four of Duhig, the Social Sciences and Humanities Library. I scurry around the familiar aisles in search of Virginia Woolf and Sylvia Plath, my closest companions these past few months. I set up my study nook, always one of the individual pods facing the window with a nearby power point. Order calms me. Laptop on and thesis open, I treat myself to the first fizzer —always pink—of the day. It’s 8am. My 8000 word thesis is due at 4pm. The Sylvia Plath Effect: Mental illness in celebrated literature from twentieth century female authors. 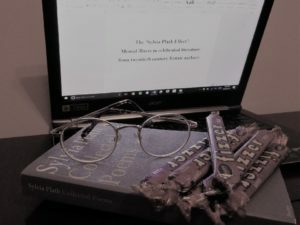 A two-part essay, the first part explores how Woolf, Plath, and Keyes wrote about their mental illnesses, and the second is a creative nonfiction piece in the form of Plath’s diary. I say thesis, but it’s a toddler paper in the world of adult theses. But it’s my toddler, and I still need to feed it, bathe it and cut its hair. Fizzer. Lollies make a great reward system. Complete two hundred words and you get a lolly. It’s a tasty incentive to work harder. Problem is I’m a glutton. The system never worked, not even in my undergrad years. Unless you count procrastin-eating. If the unwrapping of fizzers hasn’t yet annoyed my peers, the sound of my jack hammer of a right leg against the laminate desk must be. Breathe, I tell myself. Cross your legs, stretch your arms, crack your neck. ‘Ps get degrees’, that is, ‘passes get degrees’. This proverb served me well throughout my education, and I’ve had many a one-night stand with assignments which earned me distinctions as testament to the fact. Until now, that is. I’ve worked harder on this assignment that the rest of my degrees combined. But I just can’t seem to let this paper go, finding more and more wrong as I edit for the umpteenth time. I expand on each author’s feminist wave and how it influenced their writing. Fizzer. Strengthen Plath’s character arc and the diary’s voice. Fizzer. Be fastidious with my formatting and referencing. Fizzer. 3:45pm and 536 words over the limit, I finish my toddler thesis and send it out into the world. I’ve completed my Masters. I feel nothing. No joy or relief, no sadness. Nothing. And like that I drive home. With movement, speech, and logic intact. My mother is waiting at the door for me. Despite being a head smaller, she reaches up to kiss my cheek and squeezes me tight. ‘Good.’ I smile at her. Mulling over the options for my first act of freedom, I decide on a killer: cleaning my bedroom. I’ve been shuddering internally for weeks, too committed and distracted to attend to my sanctuary. The wardrobe and bookcase come first, each have their own Hannah Decimal System. After that I decide to clear out my university stuff. Apparently I’m a sucker for emotional trauma. The knee-high plastic crate is almost full when I find the paper that changed it all. Like many of us starting out, I was lost. Averaging a credit at best, I didn’t know if it was due to a natural inability to succeed or the state of my mental health at the time. I’d always given myself permission to put in as little effort as possible knowing my grade would usually be high enough. It’s funny then, when the proverb you live by results in, indeed, just a pass, and you realise you don’t want to be that kid who barely scraped through their degree. In the middle of my first semester, my tutor had given me back a paper face down. I’d folded it into my bag without looking at the grade and left the room. Down the elevator, across campus, and into my dank Mitsubishi drowning in crumpled cheeseburger wrappers. I considered what real damage would come from throwing the paper out the window without so much as a glance. I’d been thinking about quitting anyway. It took twenty minutes before I had the courage to look at it. I feel like I’m back in the car that night, choking back a hysterical laugh. For the first time since starting my postgraduate degree, I received a distinction. For the first time that year, I felt like I actually belonged at UQ. For the first time, in a long time, I was okay. It’s funny how something so small, so insignificant in time to come, can have such an effect on your self-worth. That distinction made me believe I could get my masters. I don’t even hear my mother come in before she hugs me, transporting me from the past to the present. Safe from harm. ‘So how does it really feel?’ she asks again. ‘Wonderful.’ And it really does. Hannah Towers, Master of Arts 2016, Gold Coast. This entry was posted in Family and tagged 2010s, Family, fizzers, library, masters, Plath, self-worth. Bookmark the permalink.